I'm curious, did you even do your research on penguins? They're suffering! I bet they didn't even get paid for that ad. Have you heard of the term exploitation? Great post, and a great magnet for today. We are supposed to get 7-10 inches minimum here. Fun. I'm not gonna lie, the only thing that I thought about was whether or not they actually bought the rights to the image and if the photographer got paid. Heh. 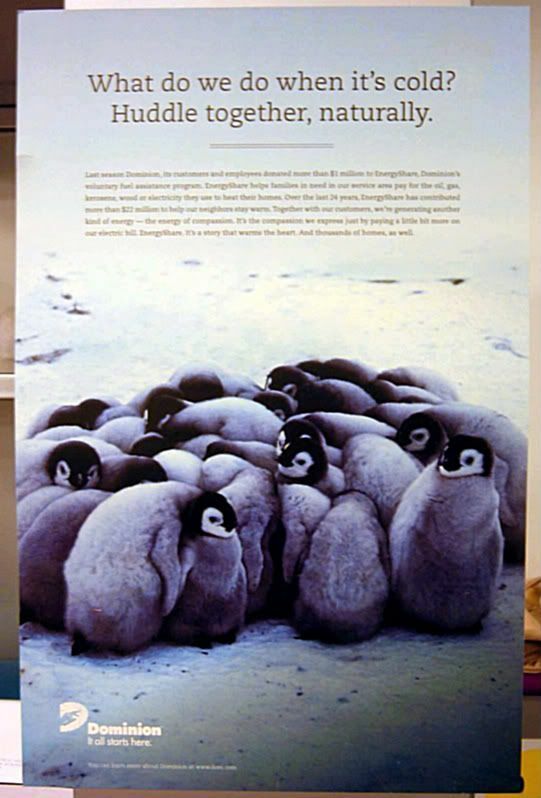 Poor penguin babies. And, thanks, Erin, hoping your snow wasn't too bad. I hunkered down indoors before the snow started to stick. But this year I'm in California, and I've been complaining about the fact that my Jeep's heater is broken, and I'm cold when I have to drive anywhere in this sunny 60 degree cold snap we're having. Hope the snow is pretty and not too obnoxious!